Liverpool turned things round vs Burnley this evening, as a goal from Roberto Firmino saw the Reds take the lead vs Sean Dyche’s men at Turf Moor. Having gone 1-0 down to a Jack Cork goal, the away side levelled things up through James Milner, with Firmino then scoring in the 67th minute to give Jurgen Klopp’s side the lead. 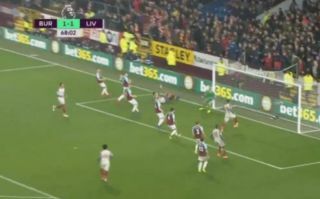 A free kick into the Burnley box was turned across goal by Virgil Van Dijk, as Firmino tucked the ball home into an empty net to give his side the lead. This came just minutes after Firmino was brought onto pitch to replace Divock Origi. An inspired substitution from Klopp, it seems! Roberto Firmino scores less than 180 seconds after coming on the pitch.